My friend Paul is unlike any person I know. A runner, tennis player and coach, he has brought the joy of sport to more people than I could ever count, just because he enjoys connecting people with activities they’ll enjoy. He is happiest when he helps someone else find happiness. It probably sounds ridiculous that anyone’s motives could really be that pure and simple. If you know Paul, then you know. If not, you’ll just have to take my word. 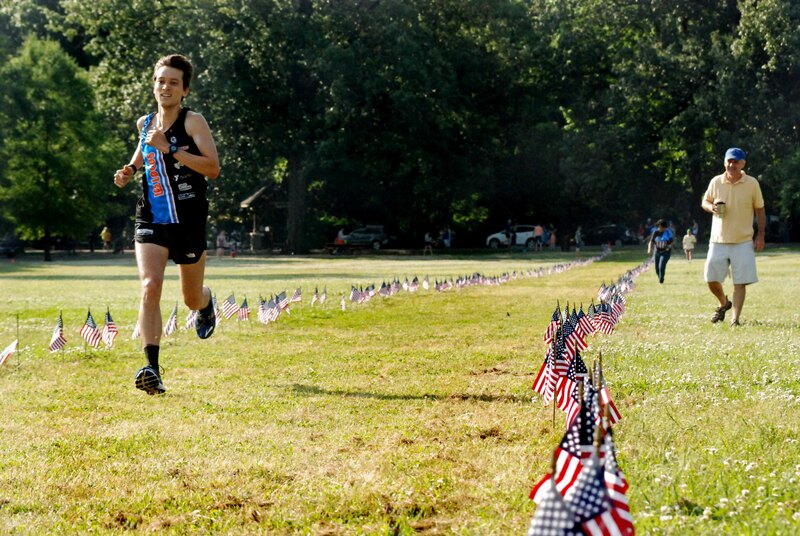 Two years ago Paul started a Memorial Day race because there was no local running event dedicated to local servicemen and women killed in the line of duty. 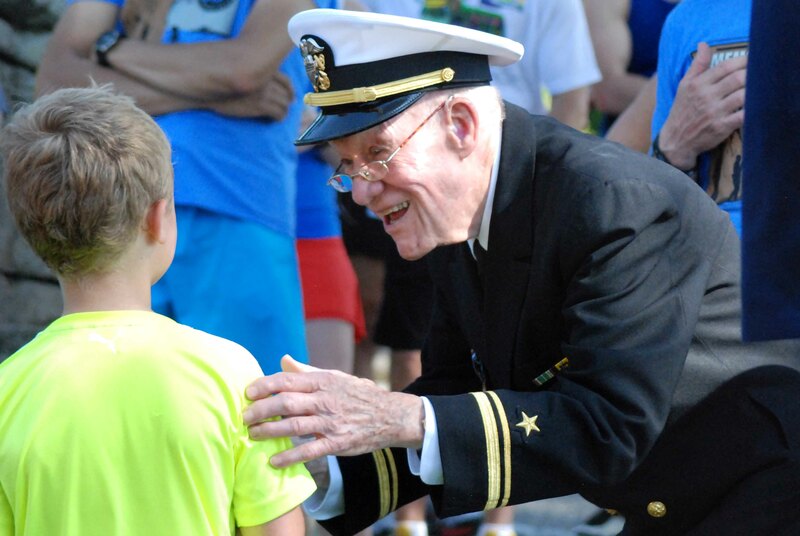 Race proceeds benefit Forever Young Senior Wish, a local program that grants wishes for veterans 65 and older. 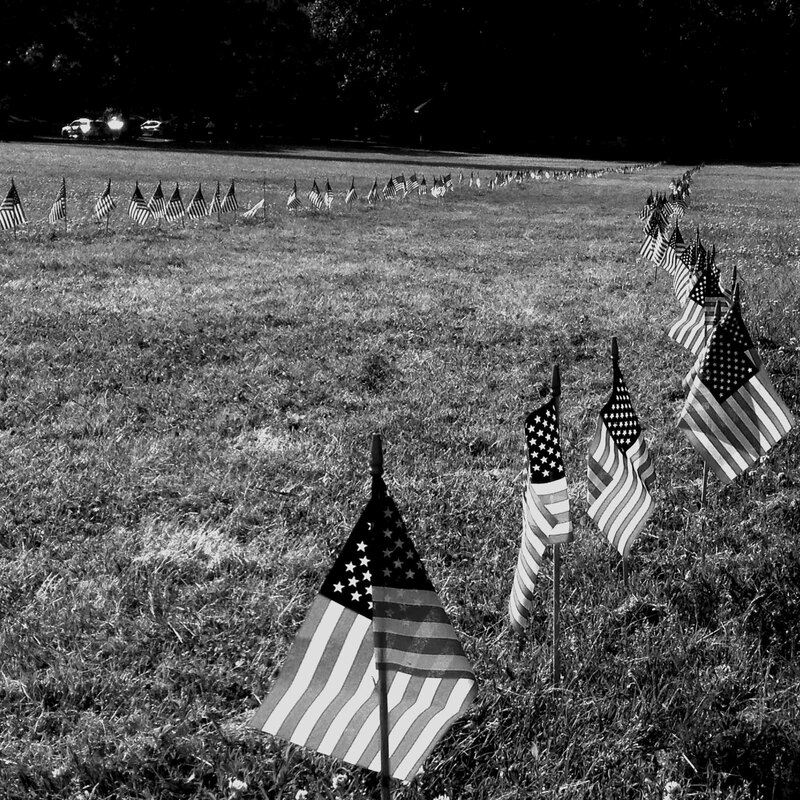 It’s a small and friendly race, staged near the local memorial wall in Overton Park. It draws maybe 250 runners. This year Paul added a wheelchair race, the only dedicated wheelchair race in the city. It’s great, all of it, really great. Next month, with a gift from the Reagan Legacy Foundation and a (small) bit of extra cash from today’s event, Forever Young Senior Wish will take 12 men to Normandy, 70 years after they first landed there on D-Day. One of those travelers will be Lt. (Ret.) Bob Bedford who at age 95 still fits easily into his dress uniform. 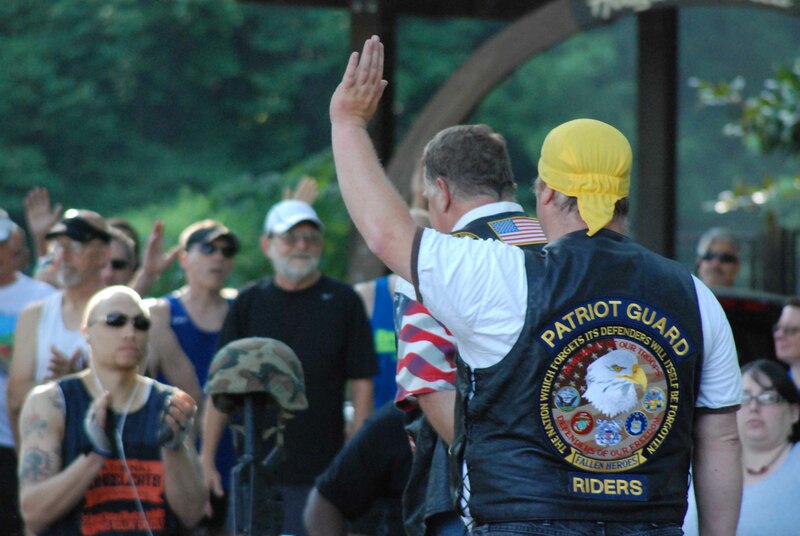 But today Bob was busy charming the crowd, kissing the women and saluting the veterans who ran a race on a hot morning, finishing down a chute lined with 1536 flags, one for every local fallen hero. All because one ordinary guy thought something important was missing in Memphis. Paul will likely be reluctant about this post; he’ll likely say I shouldn’t have written it, that he deserves no credit, that the day should be about the memory of people who made the ultimate sacrifice – great men and women, he’ll say, unlike himself. Some of us, though, need ongoing everyday reminders to keep us from navel gazing. We need help from the living as well as the dead. Help to remember that life is full and messy and complicated, and in it there are people who are good. Well done, Paul. Henry Jr loved the wheelchair race and the new friends he made. Thanks, Henry. I didn’t know he was there until they called his name at the awards ceremony. Don’t know how I missed seeing him, but I’m sorry I did. He has long been one of my favorites, with that wry sense of humor he gets from you. Glad he’s back in Memphis. Good post Jennifer! And Paul – great job, as always! Bravo, bravo Paul and Jennifer. Paul for beginning and expanding this wonderful event and Jennifer for chronicling it in such a way that everyone who reads about it will make a mental note not to miss it next year. Great post Jennifer. Describes Paul perfectly! Best to both of you! Previous article Remember what’s possible. Next article In praise of epic failure.